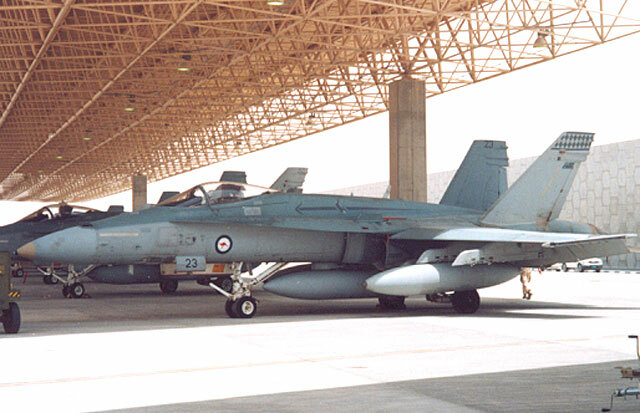 On February 7th 2003 the Australian Government announced the forward deployment of Royal Australian Air Force (RAAF) units to the Middle East Area of Operations (MEAO). This deployment was to be part of Operation Bastille, the announcement coming after that of the deployment of a Special Forces Task Group and Navy ships on the same operation. The objective of Op Bastille was to ensure that the Australian Defence Force (ADF) was given the best possible opportunity to prepare for the possibility of conflict in the event that a diplomatic solution could not be found. The deployments were also designed to support the United Nations disarmament process by contributing to pressure on Iraq to comply with its international obligations to end its program of weapons of mass destruction. 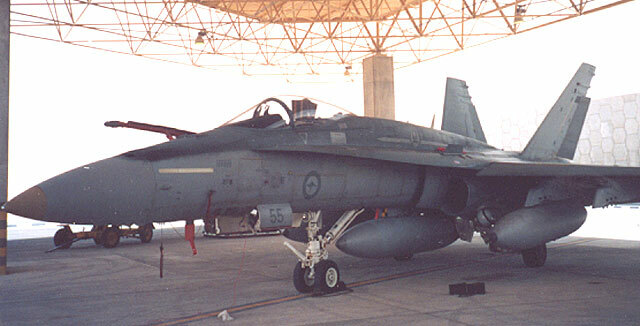 The RAAF elements committed to Op Bastille included a squadron of 14 F/A-18A Hornet aircraft. 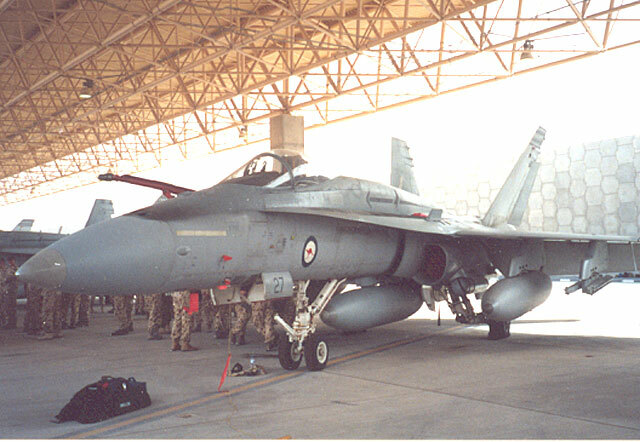 The Hornet squadron, drawn largely from 75SQN, were farewelled from RAAF Base Tindal on the 8th. 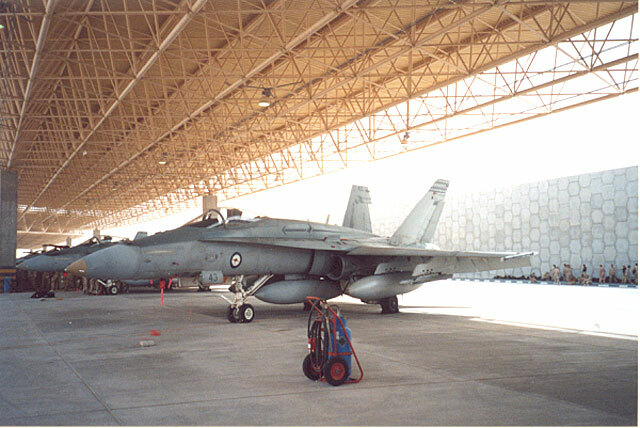 The RAAF unit arrived at its deployment base in the MEAO between the 10th and 16th of February, from which time they commenced training operations to assist familiarisation with the operational environment. Diplomatic efforts to convince the Iraqi Regime to comply with UN resolutions ultimately failed and as a result the Coalition launched Operation Iraqi Freedom on 19/20 March 2003 with a missile strike on key facilities in Baghdad, widely reported as targeting Saddam Hussein himself. The commitment of ADF units to Coalition operations against Iraq, as announced by the Prime Minister was given the name Operation Falconer. 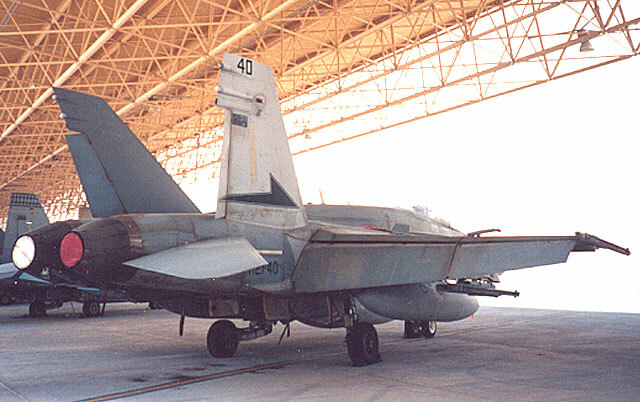 The Hornet Squadron immediately commenced operations, with both making significant contributions to the Coalition effort. 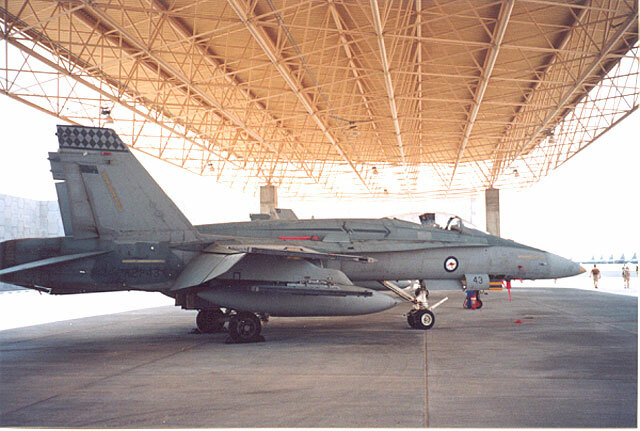 The use of RAAF fighters in Operation Falconer was of particular historical significance. 75 Squadrons combat air patrols into Iraqi airspace marked first time that an RAAF fighter squadron had conducted offensive combat operations since 77 Squadron deployed to South Korea with its P-51 Mustangs in 1950*. 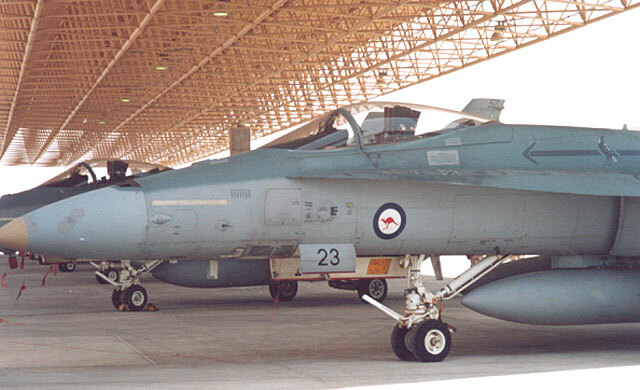 There was an even deeper historic connection to the MEAO as RAAF pilots renewed acquaintance with towns such as Basrah and Al Kut, familiar to the aircrew of Mesopotamian Half-flight which had operated through the same region between May and August 1915 in the very first overseas deployment of Australian combat aircraft. 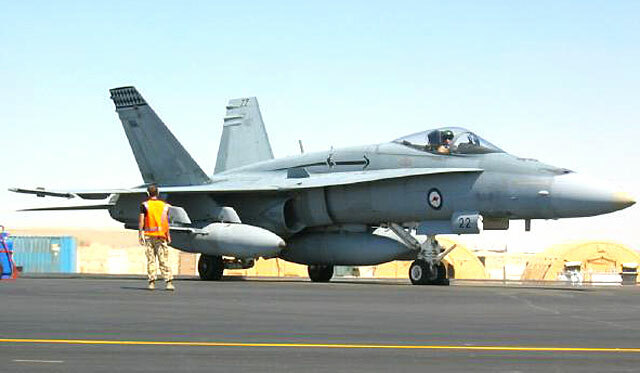 Much of the terrain that had been reconnoitred by the Half-Flight during the early Middle-East Campaigns of WWI was to become the principal operating area of the RAAF Hornet squadron 88 years later. 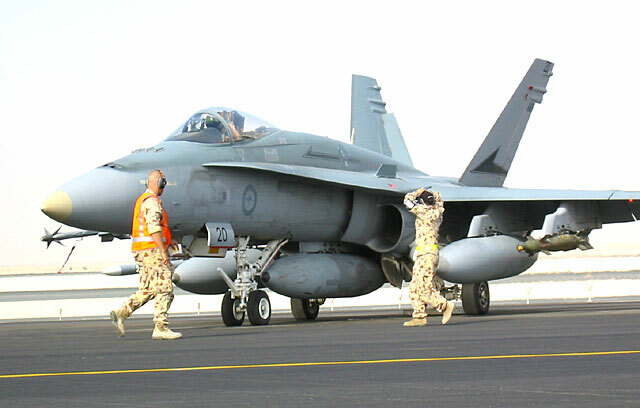 The types of missions undertaken by the RAAF Hornets between 20 March and 2 May 2003 ranged from defensive counter-air (DCA) to close air support (CAS), and strike. 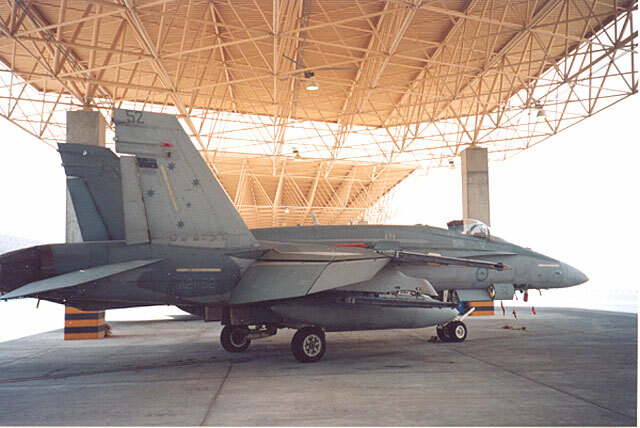 The full multi-role capability of the F/A-18 was exploited, with aircraft on DCA sorties being armed for both air to air and air to ground missions, whilst those on CAS or strike missions carried sufficient air to air weapons to deal with any latent threat from the Iraqi Air Force. This allowed the aircraft to respond to a wide range of tasks, including defending against hostile fighters or striking a target of opportunity on the ground. Missions such as these could last several hours and involve multiple refuellings. 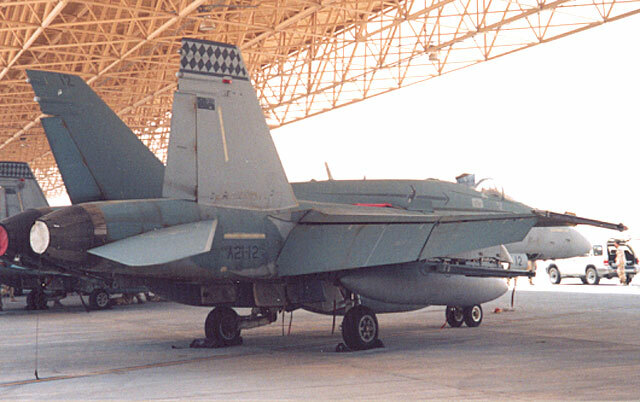 A typical weapons loadout used for a DCA mission over Iraq would be 2 x AIM-9 Sidewinders, 3 x AIM-120 AMRAAMs, 1 x GBU-12 500lb Laser Guided Bomb, an AAS-38 Nighthawk FLIR pod and 3 x external fuel tanks. 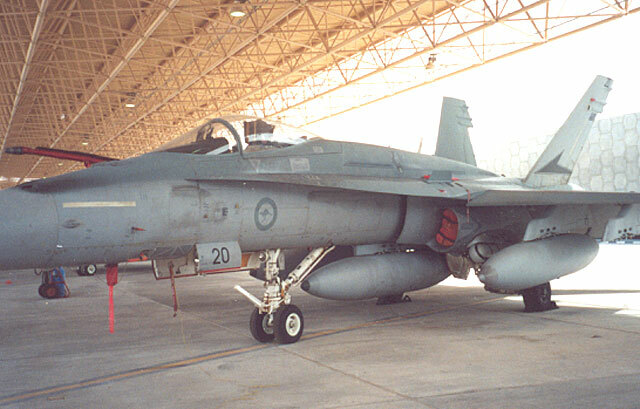 The first bomb to be dropped in combat by an RAAF aircraft since 2 Squadron Canberras ended their Vietnam War operations in 1972 was delivered on 22 March 2003 onto a time-sensitive military target. 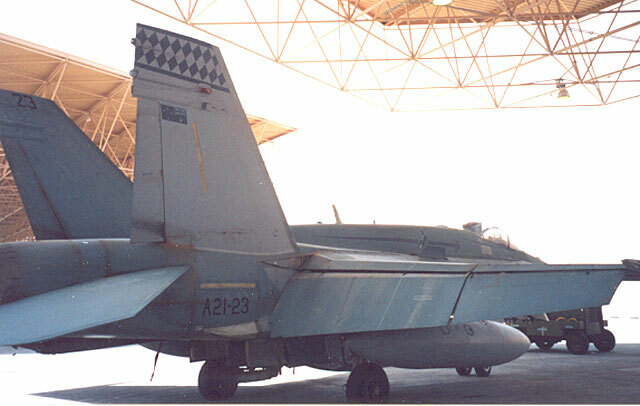 * The aircraft to which the honour fell was F/A-18 A21-22. This aircraft was a 75 SQN airframe with the older style of black squadron markings and full colour RAAF roundels. At the time of this mission it was configured with the standard DCA weapons load mentioned above. (* The last time an RAAF fighter aircraft dropped ordnance in anger was during Operations Firedog One and Two in August 1959 and June 1960 respectively. 78 WG Sabres (3 and 77 Sqns at this time) attacked suspected Communist Terrorist positions in Northern Malaya during the Malayan Emergency whilst based at Butterworth). A number of pre-planned strike missions were flown during Operation Falconer in conjunction with the DCA effort. The targets of these strikes included the Iraqi 10th Armoured Division Headquarters and a regional Iraqi Intelligence Services facility. All of these missions were considered successful. Strike aircraft flew missions in two configurations, these being 2 x AIM-9 Sidewinders, 1 x AIM-120 AMRAAM, 2 x GBU-10 2000lb or 2 x GBU-12 500lb Laser Guided Bombs, an AAS-38 Nighthawk FLIR pod and 3 x external fuel tanks. Only three aircraft flew strike missions carrying the GBU-10 as principal weapon. These were A21-12, 40 and 43. 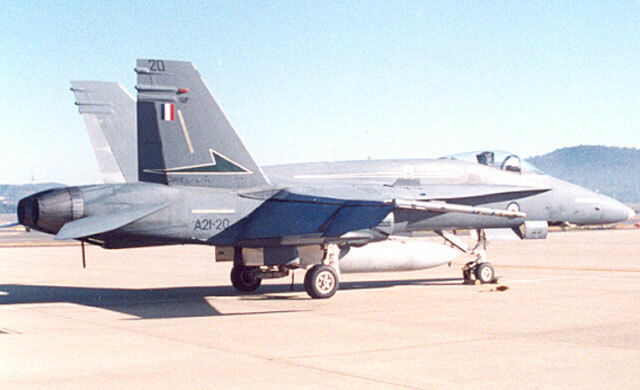 When flying close air support (CAS) missions, which made up the majority of the missions flown over Iraq, a CAS configuration was typically used. This was identical to the strike configuration above but was limited to two GBU-12 LGBs. 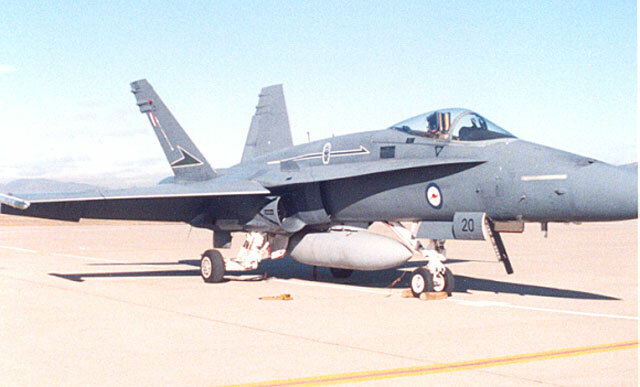 Modellers should note that these loadouts apply only to RAAF Hornets and does not reflect the various loadouts that were carried by US Navy and Marine Hornets during OIF. By the end of the campaign the Hornet Squadron had acquitted itself well, flying over 350 sorties and dropping over 120 LGBs. CAS was provided to the 1st Marine Expeditionary Force, US Army V Corps units and 1st UK Division as they advanced towards Baghdad. The types of targets struck by the Hornets ranged from tanks to artillery and airfield infrastructure. These missions were wide ranging covering Iraq from Al Kut and Al Amarah in the South to Baghdad and Tikrit in the North. 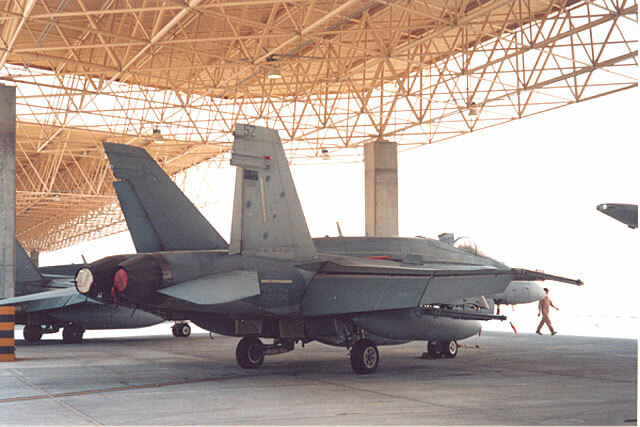 Other areas which received attention from the Hornet Squadron were in the vicinity of Abinaria Dam, Al Rasheed airfield and Al Assad airfield in Western Iraq. 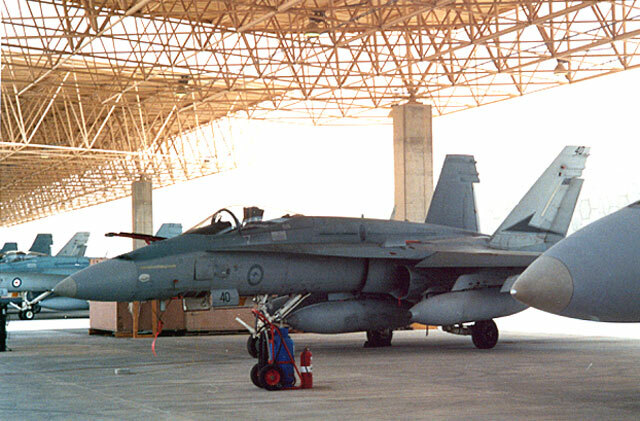 On 12 April 2003 the F/A-18s were called on to provide close air support to Australian Special Forces as they moved against objectives at Al Assad. 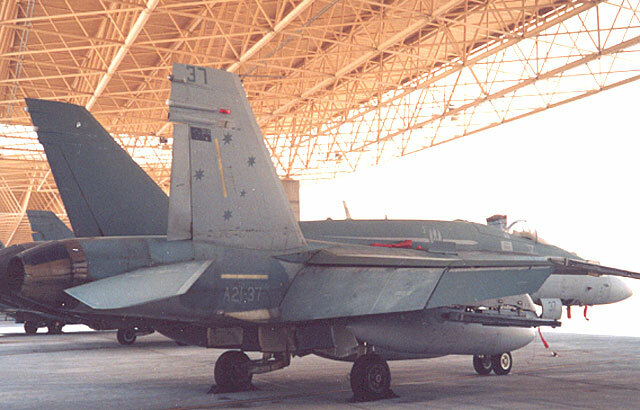 Once again this was a first as RAAF aircraft directly supported Australian ground forces, something that had not occurred on operations since the Vietnam War. A21-12, 14, 19, 20, 22, 23, 27, 37, 38, 40, 43, 49, 52 and 55. 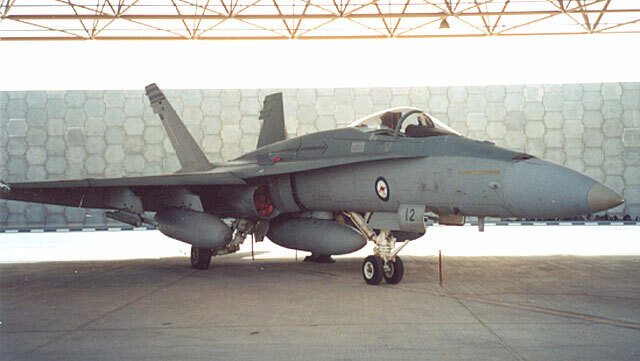 The aircraft deployed were drawn from across the entire RAAF fighter fleet (A21-1 to 57), all being delivered to the RAAF between 1986 and 1990. 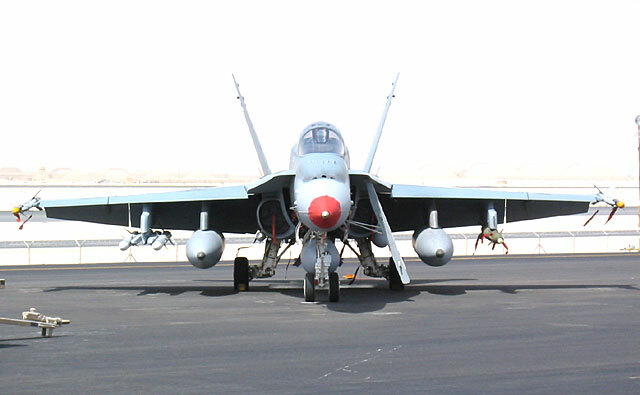 The aircraft had been subjected to Hornet Upgrade Phase 2.1 program and therefore closely match US Navy and Marine F/A-18A+ aircraft. Features of these aircraft include the APG-73 radar, avionics and navigation system upgrades. 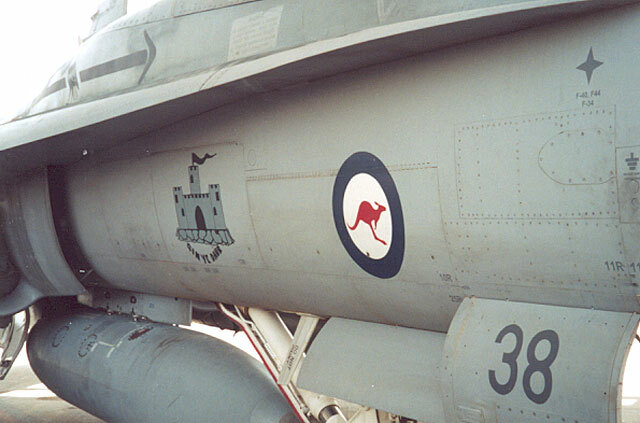 All three current RAAF fighter squadrons (3, 75 and 77) contributed aircraft and they remained in their original squadron marking schemes for the deployment. 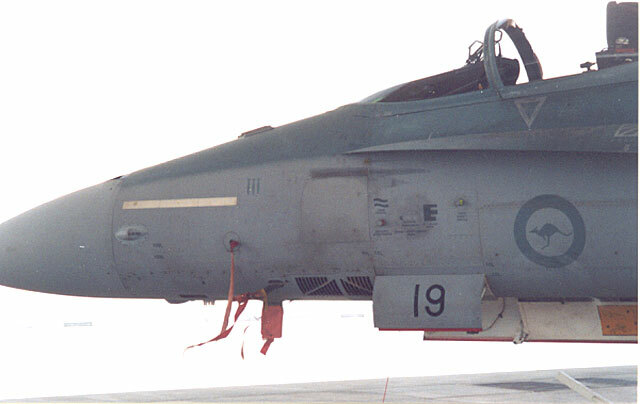 The major change was the addition of a small dark grey Australian flag in place of the old full colour fin-flash on all aircraft. 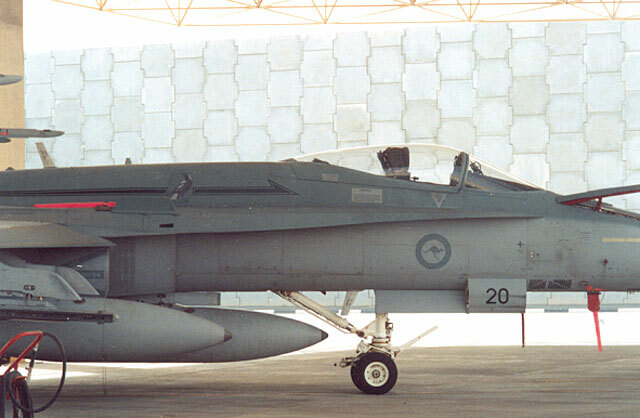 The camouflage finish was the standard RAAF Hornet scheme of FS 35237 uppersurfaces over FS 36375. 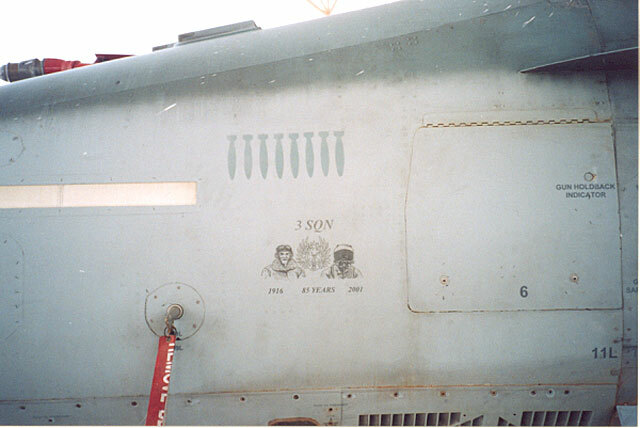 From approximately mid-April onwards bomb logs were painted on the upper left hand side of the nose of individual aircraft denoting missions were ordnance was released. 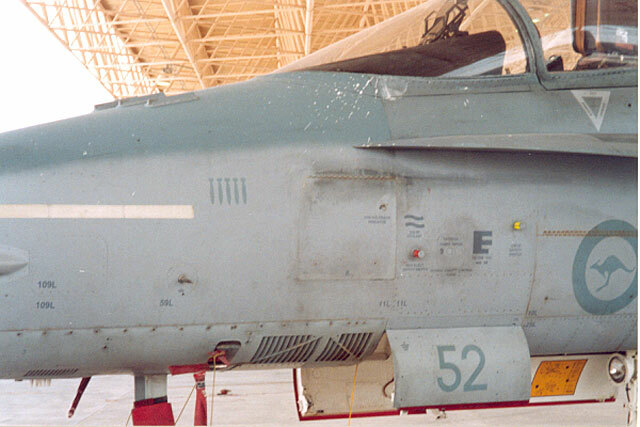 These logs were still visible on some airframes as late as December 2003 but are gradually disappearing as jets enter the maintenance cycle. 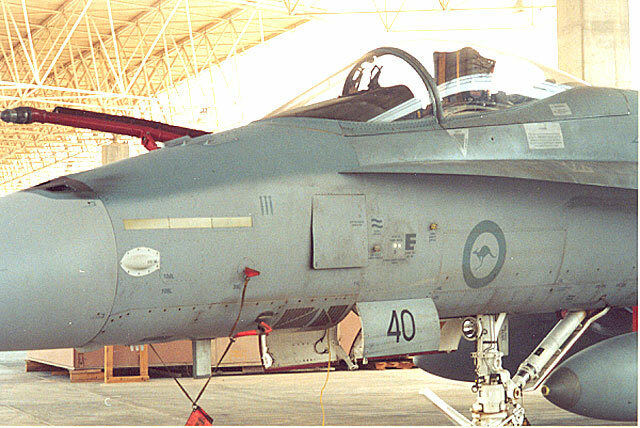 Unlike other Coalition partners, the RAF and USAF, the application of nose art during the campaign was extremely limited on RAAF Hornets. 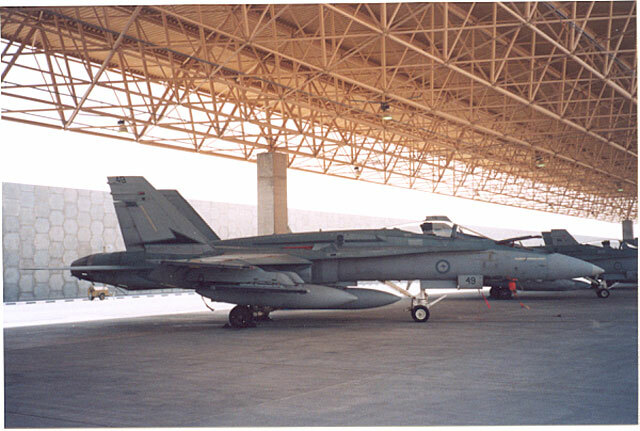 Only one aircraft received artwork in theatre, A21-38. The artwork was placed on the jet at the behest of members of No 603 Squadron RAF Reserve who had deployed to the same operating base. 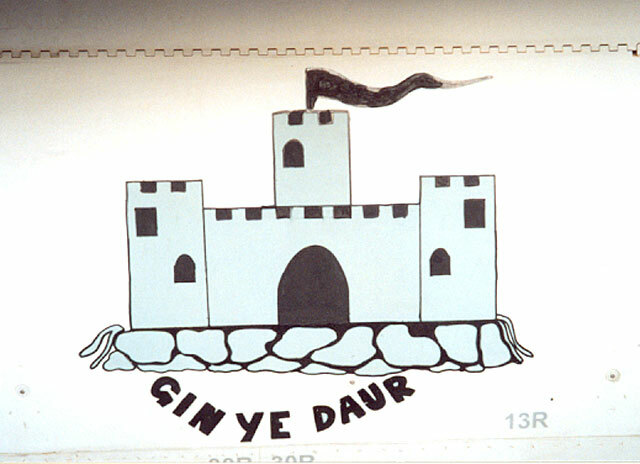 This artwork was derived from the heraldic charge of the squadron’s badge. The second aircraft, A21-55, bore a small design commemorating the 85th Anniversary of 3 Squadron. This design dated back to 2001 and was not applied for the operation. 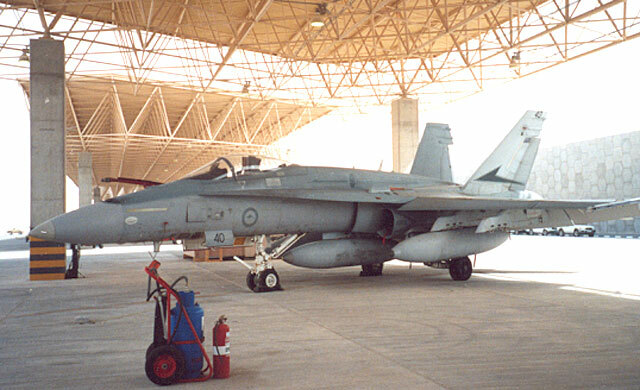 Distinct variations in markings between the RAAF Hornet squadrons are apparent from photos of the Hornet Squadrons aircraft in the MEAO. 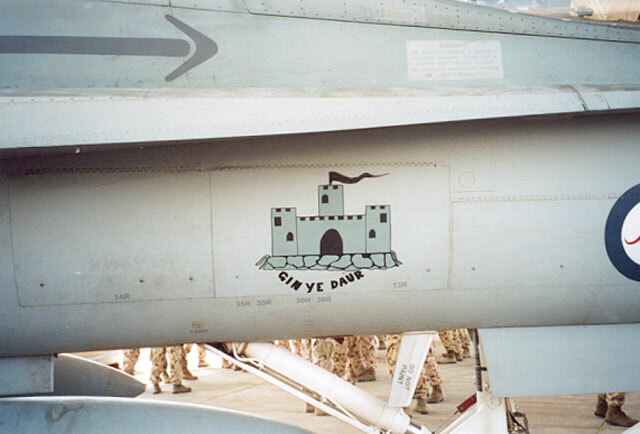 3 Sqn had fully toned down its aircraft with all markings appearing in lo-viz grays. 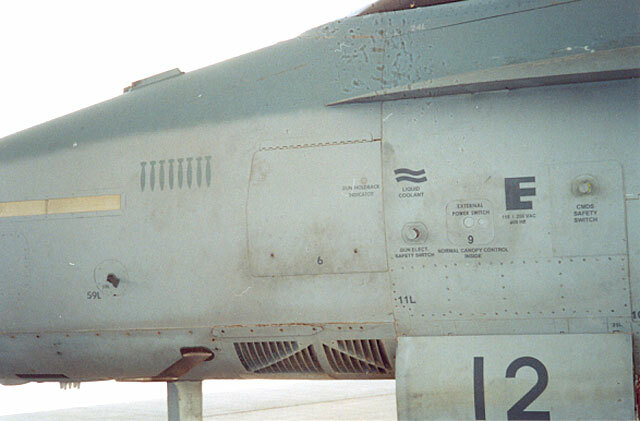 77 Sqn had removed the white from their Squadron colours, leaving the Brunswick Green and had also adopted lo-viz grey roundels, but left all serial numbers in black, whilst 75 Sqn toned down their squadron colours and serials (dark grey vice black) but retained full colour roundels. 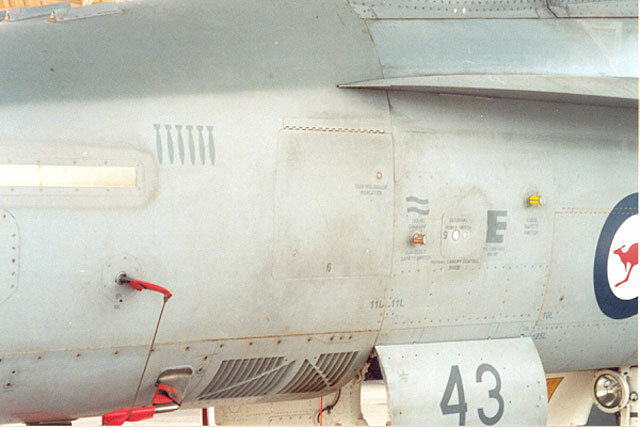 No aircrew names or other unique identifying markings were carried on the jets for reasons of operational security. This practice is in common with USAF units in the theatre. Anomalies existed even between aircraft drawn from the same Squadron. One was the historically important A21-22, which retained the older full black style Squadron colours of 75 Sqn. Close examination also shows the direction of the Magpie varies. 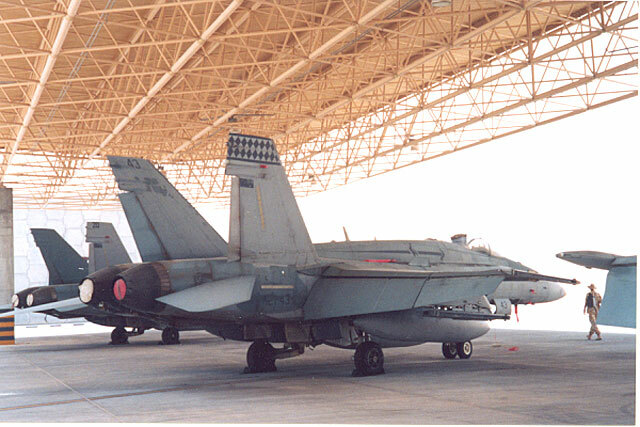 75 Sqn’s Magpie has been applied incorrectly since re-equipping with F/A-18s in the late 1980s. 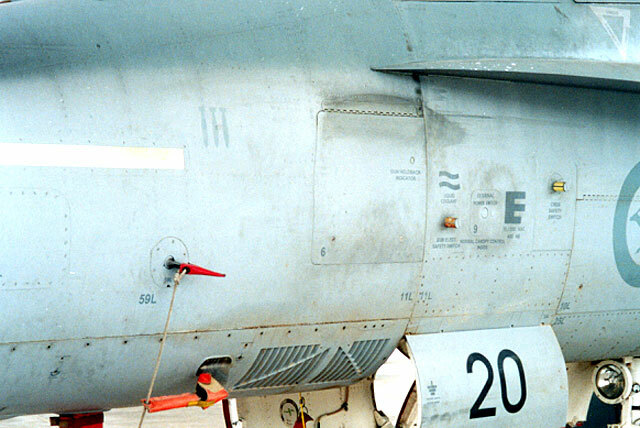 Heraldry requires an animal to face the direction of the enemy (or nose of the aircraft). 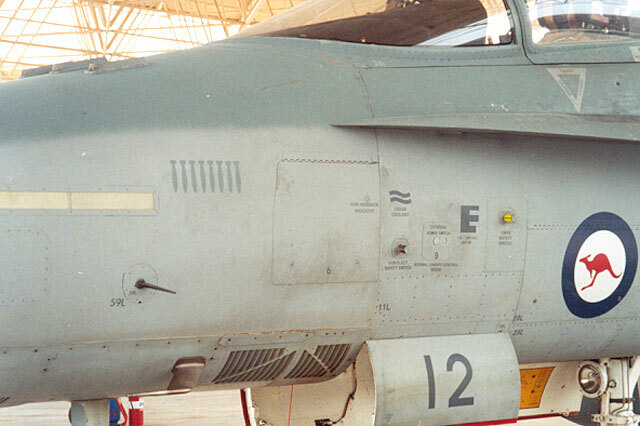 On Hornets this was interpreted as the head of the bird, but as the bird is looking back over its shoulder the correct orientation should be chest forward as on A21-20 and A21-12. This change is being made on the aircraft as they receive repaints. One zap worth noting was the replacement of the 77 Sqn Oriental Lion with lo-viz Magpies on A21-20 (this aircraft had also formerly been one of the overall Gunship Gray colour trials aircraft in the early to mid 1990s). d. adding a dummy catapult bar. This bar is the same length and weight as the original but is made from square section tapered metal (see the photos) with none of the necessary parts to engaged the catapult. 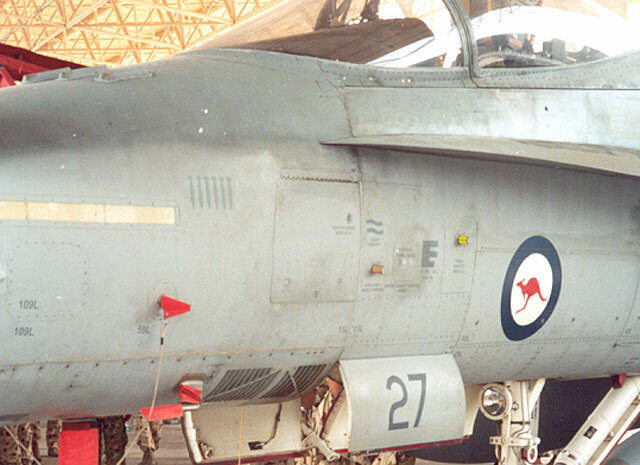 This mod was designed to reduce nosewheel shimmy that had plagued the aircraft since it first entered RAAF service. The recently released Academy 1/32 F/A-18C kit is the best base kit for such a model, requiring only the modification of the tail fins to A model standard, application of the RWR fairings and the addition of the GPS dome on the spine to create an accurate replica. 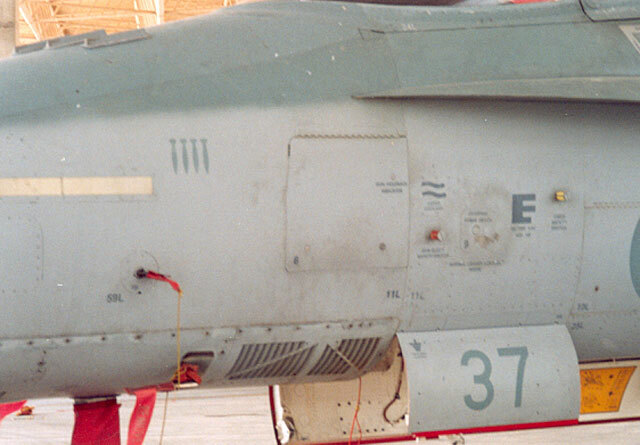 Note the IFF "bird slicer" antenna on the nose forward of the windscreen, the bomb log painted on the nose and the generally heavy weathering. 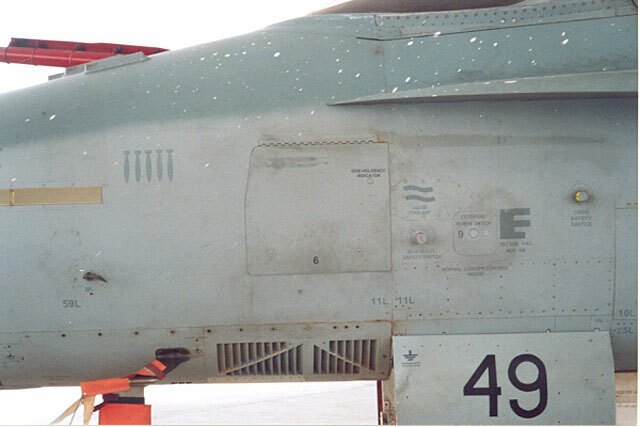 This nose dis-colouration is very obvious and was even still apparent on the heavily weathered Falconer aircraft. 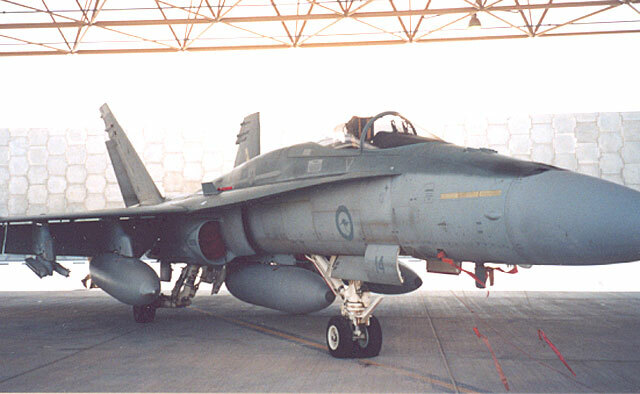 RAAF F/A-18A Hornet (Upgraded); A21-20 of 77 Sqn RAAF. This aircraft has been "zapped". 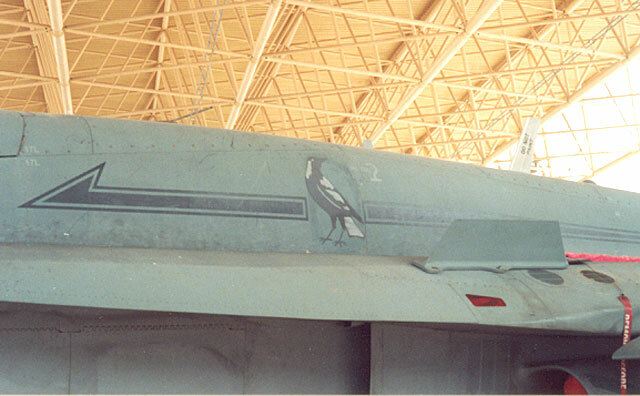 The 77 Sqn "Grumpy Monkey" has been painted out and replaced with the 75 Sqn backwards-facing Magpie. This view also shows the swept-style antenna on the spine. 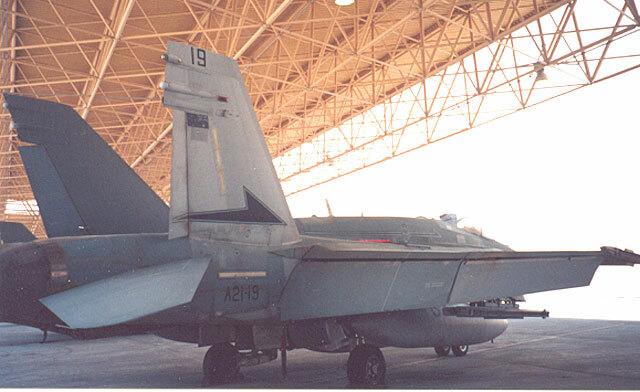 A full view of this aircraft is shown in the title image.